When Facebook ended the “free love era”, they drastically scaled back the organic reach of brands. It seemed for many marketers as if history repeated itself. For a few years they enjoyed the exposure the network brought. But today, if you want exposure, you’ll need to pay to play. For brands on Facebook, these are dark days. They can choose to spend more money to reach fans they had already accumulated in the past, but Facebook will likely decrease branded reach even further. It isn’t long before other large social media networks will do the same. What are brands to do when social media networks are choosing to reduce the freedom that brands can play on their networks? 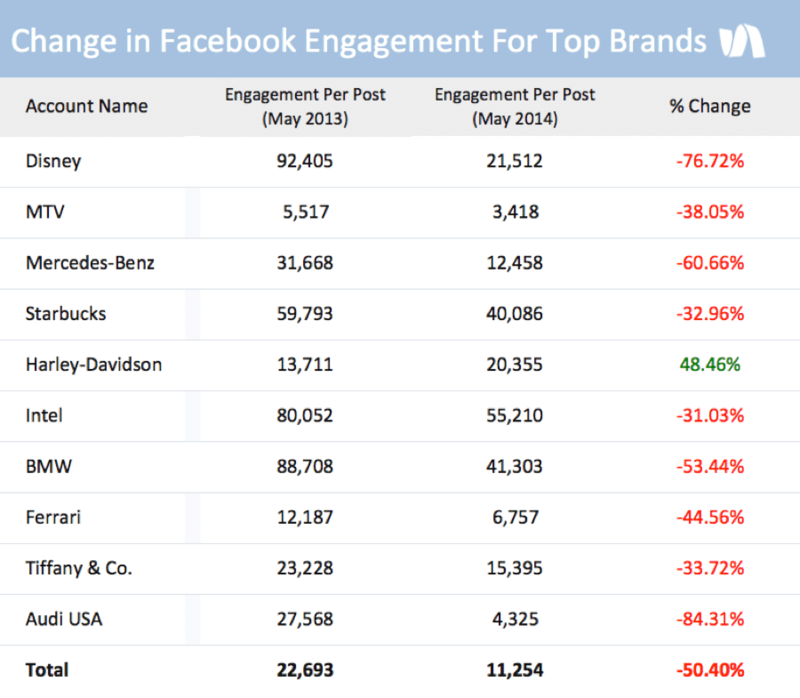 According to a new report from Simply Measured, the total engagement for the top 10 most-followed brands on Facebook has declined 40 percent year-over-year—even as brands have increased the amount of content they’re posting by 20.1 percent. To understand a little bit on what’s happening, we need to go back a few years in the history of Facebook, and then look into the future of what is most probably going to happen. In the beginning, Facebook was showing the news-feed of your friends. But then Facebook became wildly popular, and the news-feed of users grew. It started becoming quite impossible for users to keep up to date with all what was happening. That’s when Facebook began filtering. But as Facebook kept on growing, and getting more and more eyeballs, they also smelled the money. And so Facebook pages where born. Businesses could now create status updates that also became part of users’ news feeds. Brands discovered that status updates pushed into followers’ news feeds were a powerful form of free advertising to a captive audience. So again news-feeds started growing too fast, and Facebook acted again: Edgerank was born. Facebook implemented an intelligent filter that tuned back brand messaging of those trying to get engagement, just for the purpose of getting engagement, while forgetting the end-users’ needs. By filtering the streams of end-users, based on behavior and interest, platforms like Facebook are protecting themselves to remain relevant to end-users. But then Facebook changed their algorithm again to what has become known as Facebook Zero. Brands noticed their average organic reach (the percentage of their fans that actually potentially see each post) was steadily declining. Ogilvy & Mather reported that average reach had dropped from 12% in October 2013 to 6% by February 2014. Another and newer report from Simply Measured seems to be confirming that trend. In a great blog post on marketingland.com, Mark Traphagen explains why Facebook is acting like this, later on confirmed by Facebook themselves. In short, Facebook is filtering organic reach because they scientifically know that this is what their users want, while keeping a good balance with the business side of things. There are way too many news items fighting for end-user attention that they have to throttle back on the news-feed. To me, this is when Facebook decided it was time for Social 3.0. If they want people to stay as longs as possible, they need to give end-users feeds they want and like. And they want people to stay as long as possible, because that’s what attracts paid advertising. So they throttle back on organic. For brands on Facebook, these are dark days. They can choose to spend more money to reach fans they had already accumulated in the past, but Facebook will likely decrease branded reach even further when needed. And whenever they please, than can increase pricing of paid promotion. Recent moves from LinkedIn and Google are starting to show the same direction. In the beginning LinkedIn started out as a place where business professionals could connect. And employers where able to connect with job-seekers. Not so long ago, LinkedIn has chosen to become a content platform. First 150 thought leaders where selected from around the world which quickly gathered massive traffic to that content. In the spring of 2011, LinkedIn Today was launched (now Pulse) with the goal of getting professionals the news they needed at a massive scale. Then expanded that list to 500 thinkers, and just recently they are opening up the publishing to the masses. The reason they are doing this is to get more traffic to their site. Brands are encouraged to publish more content, and are getting tools to get better in doing that (Content Marketing Score and Trending Content-indexes have been introduced by LinkedIn). Today all traffic to the content of brands is still free. But for how long? also LinkedIn will have to throttle back the news-feed, and will enter the era of Social 3.0. And what about Google? Panda and Hummingbird are versions of the search algorithm that Google uses to show you search results. Recent versions of the search algorithm have become so advanced that it is harder and harder to get organic traffic, unless you are providing useful, relevant, regular, quality content. Seems that Google is also throttling back on organic and choosing for Social 3.0. OK, let’s get this straight. Social media in the online world was to brands what was ‘word of mouth’ in the offline world. But when news feeds became too busy, Facebook and LinkedIn (going to) shut down organic traffic. What this comes down to is that brands need to turn back to paid advertising. Did I just say that? Brand need to go back to paid advertising? We all know that end-users have become blind for advertising. One thing social platforms cannot change is people having social updates and social conversations. It’s the very lifeblood of their existence. As they say in French, it is their “raison d’être”. When people connect with people that have common interest, relations or background, something fantastic happens: they trust each other. And when people trust their peers, they’ll be more inclined to believe and act upon stories shared from one to another.